Thanks to the work of a Liverpool voluntary group, the Anfield Alley Angels, set up by housing association Your Housing Group, the recycling rate in Anfield in Liverpool has increased by nearly 80% from 6% to 82% in six months. This is almost three times the current rate for Liverpool as a whole. To celebrate the success of the initiative, which started in June last year, a special clean-up event took place on Friday 25th January. Members of the local community, local councillors, and representatives from social landlord, Your Housing Group, who have more than 1000 properties in the wider area, rolled up their sleeves and took to the streets of Anfield Village to join the weekly clean-up. The day included litter picking, brushing the alleyways, weeding, bin store tidy-ups, and information on the Blue Bag recycling scheme and Bulky Bobs bulky item collection service were handed out. Free dog waste bags were offered to dog walkers. 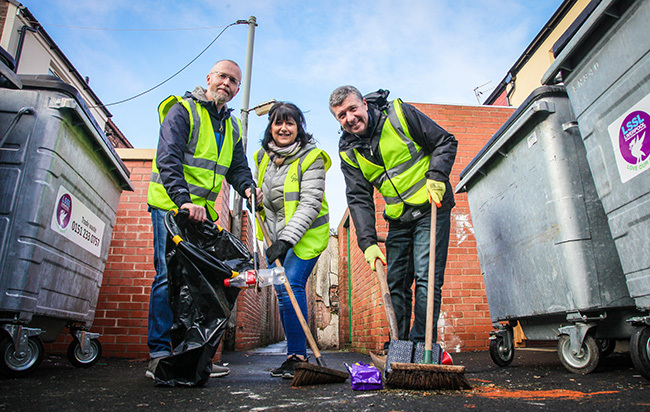 The Anfield Alley Angels project, run by Your Housing Group in partnership with Liverpool City Council, encourages local residents to work voluntarily to clean-up their area. Your Housing Group in partnership with Liverpool City Council and Liverpool Football Club have invested £260m in regenerating the area over the past 15 years, providing much needed homes and helping build a better community. So far 50 local residents have been involved with the Alley Angels project, including a regular clean-up team of seven people, with more than 250 hours of their collective time donated since the project started seven months ago. Following the initial success, the organisers are keen to recruit more willing volunteers. This will continue to help tackle the problem of rubbish being dumped in alleyways which attracts rats and other vermin. Any local residents interested in taking part in the weekly Anfield Alley Angels weekly clean-ups should contact James Coates, community regeneration co-ordinator for Your Housing Group on 07795 471359 or email James.Coates@yourhousinggroup.co.uk. Anfield Alley Angels meet up every Wednesday at 10.30am at Christ Church on Walton Breck Road.